An elementary education degree prepares students to create, teach, and asses lesson plans for students. Elementary teachers can teach any grade from kindergarten through eighth grade. Did You Know? As of the fall of 2016, there were about 50.4 million students in American primary and secondary schools combined. This includes 35.4 million pre-K through 8th grade and about 15.0 million grades 9 through 12. Keep in mind that many U.S. states have different ways of separating grades. For instance, some states may not have a middle school classification, which means elementary school may go all the way through 8th grade. Other states may have other distinctions. Check with your state for more information as this may affect your degree choice. While pursuing an online elementary education degree, you will learn how to teach students so that they may excel and achieve their educational goals. Many programs review methods of engaging students in analytical, creative, and critical thinking. Some elementary ed courses also focus using technology to enhance lesson plans and promote engagement. By learning different approaches to teaching, future teachers may be able to better serve the unique needs of children. These teaching techniques may also help students to close the achievement gap. The achievement gap is the negative effect of factors on student learning. Such as a disability or coming from a low-income or ethnic-minority family. This is measured by metrics such as students' grades and test scores. Many elementary education programs aim to reach students of different backgrounds, cultures, and learning styles. Online elementary education degrees are designed to prepare you for the classroom setting. Courses typically cover the concepts to test the effectiveness of current teaching methods. And, how to improve your own strategies. Check out the list below for some of these important topics in elementary education. Typically, schools that offer an elementary education degree online also cover many other fundamental topics in teaching. These may include curriculum design, lesson plan creation, and how to assess the progress of each student. Each school has a unique design and course of study. Specific topics and approaches may vary. Many elementary education online courses cover the principles necessary for effective teaching. These consist of creating lesson plans that keep students engaged and help them understand the curriculum. It may also include creating and grading tests and quizzes, as well as preparing students for standardized tests. Elementary education courses may also cover different approaches in enforcing classroom rules. This may help students to stay focused and engaged on current lessons. Some of the specific elementary education courses you may take include those listed here. Usually, elementary education programs also require you complete general courses to earn your degree. These may include courses in business, history, art, and other subjects. Each school is different, so you should check with a few options to find a school that matches your goals. To become a licensed teacher, you must also complete a certain number of student-teaching hours. This must be done under the supervision of an experienced teacher. [i] The exact hours may vary from state to state. Many elementary education bachelors degree programs require 12 consecutive weeks of full-time student teaching. The student-teaching segment of your elementary education degree may help with the following concepts. Student-teaching may provide you with valuable experience so you feel comfortable in the classroom upon earning your degree. Some of the available concentrations in elementary education include those listed here. Keep in mind that some schools may offer more concentrations and other schools may not offer any. You should research a few schools to find a perfect match for you. Most elementary education bachelors degree online programs cover kindergarten through 12th grade. However, some programs focus courses and topics up to 4th, 5th, or even 8th grades. Specific admissions requirements vary, depending on the school. For instance, some schools ask that you pass a basic skills test to determine if you need any extra courses. Check out a few schools to find one that matches your goals. Is Elementary Education a Bachelor of Arts or Science? Elementary education bachelors degrees can be either a bachelor of science (BS) or a bachelor of arts (BA). Both BA and BS elementary education degrees typically take the same amount of time and have similar requirements. One of the main differences is that av BS degree normally offers fewer electives and requires more courses inside of the major. BA degrees may offer students a chance to take many liberal arts electives. This may provide you a more well-rounded, general education. Some schools are set up so that, if you pursue a BA, you may study the subjects listed here. Some schools allow you to pursue a BS degree in more technically focused subjects, such as mathematics or science. 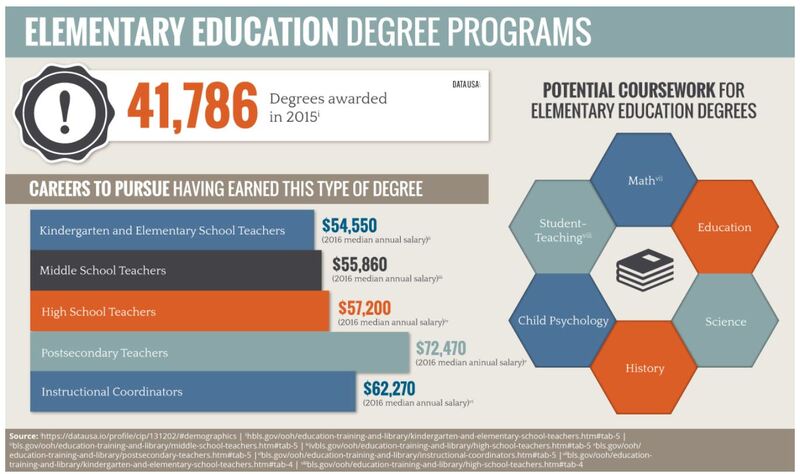 Most full-time students can earn their elementary education bachelors degree in four years. This may depend on when courses are available and the specific design of a school. As you could expect, it takes longer for a part-time student to earn their bachelors degree. Aside from regional accreditations, there is one important national accreditation to look for. It is awarded by the Council for the Accreditation of Educator Preparation (CAEP). The goal of CAEP is to assure quality in educator preparation. They look for programs that show the qualities listed here. These requirements, ensure that graduates from accredited schools will be prepared to teach upon graduation. If a school isn’t accredited it doesn’t mean that it’s a bad school. It simply means that you need to perform more independent research to determine the quality of the degree. What Can You Do with a Bachelors in Elementary Education? Some of the other positions, and their 2015 median annual salary, are listed here. These teaching positions have similar requirements, though each of the different age groups has their own challenges. For instance, high school students may deal with stress of having a part-time job or preparing for the SATs. Elementary school children may be more prone to distractions and disturbances in the classroom. To become a licensed teacher, every state requires that you have earned a bachelors degree. There are more requirements that vary from state to state. Some of the most common requirements are listed here. Keep in mind that each U.S. state has their own rules. Check with your state to find your specific requirements. Typically, programs that offer a bachelors degree in elementary education know the requirements for many states.